It’s a tough one, but it ought to John Kerry’s top priority. This isn’t exactly a news bulletin, but the United States and Russia need to strike a deal on Syria, and fast. Various analysts, and Secretary of State John Kerry, say that’ll be hard, but them’s the breaks. No one said diplomacy was going to be easy. 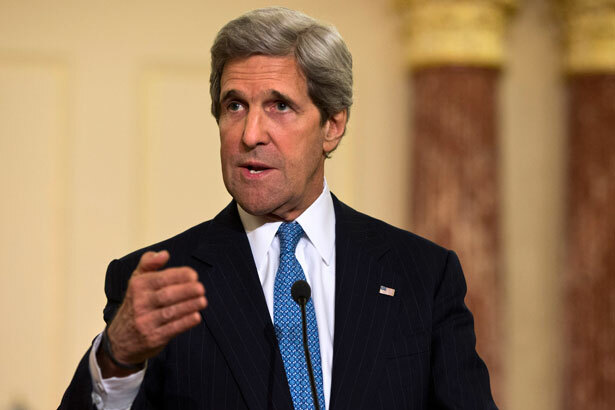 US Secretary of State John Kerry said on Tuesday he and Russian Foreign Minister Sergei Lavrov had agreed to look for ways to revive a Syrian peace plan, but admitted that doing so would be extremely difficult. We are both going to go back, we are going to explore those possibilities, and we are going to talk again about if any of those other avenues could conceivably be pursued. … I don’t think there’s a difference of opinion that [President Bashar al-Assad’s] leaving may either be inevitable or necessary to be able to have a solution. The NATO ministers also met with Russian Foreign Minister Sergei Lavrov, who warned that reports of chemical weapons in Syria must be carefully investigated to avoid a repetition of the “Iraqi scenario” in which unconfirmed allegations that the regime of Saddam Hussein possessed weapons of mass destruction were the basis for the US-led invasion. He accused Western nations of trying to “politicize the issue” and broadening the investigation. Experts were supposed to be sent to Syria to study the possible use of chemical weapons in Aleppo; instead, Lavrov said, investigators demanded access to all facilities in Syria and the right to interview all Syrian citizens. “I believe that is too much,” he said. The Obama administration expressed caution Tuesday about new claims by Israel that the Syrian government has used chemical weapons against rebels. US officials said they are still evaluating whether the Syrian regime has employed chemical weapons, a step that President Obama has said could trigger direct US involvement in a civil war that has killed more than 70,000 people. The administration’s caution is in part because Obama has set himself up by saying that any use of poison gas by Syria would change the calculation that so far has kept the United States out of directly intervening against Assad. When it comes to Russia, America must display a deeper understanding of Russia’s regional interests and take advantage of our shared concerns about Islamic extremism. Russian leaders believe that Syria is becoming a safe haven for extremists, and we should take that concern seriously while at the same time insisting on sending aid to moderate groups. This could be the basis for a new understanding with Moscow and a shared approach toward Syria. Only Russia can convince Mr. Assad that he must step aside, which is an essential first step toward a negotiated solution, and only the United States is in a position to persuade the Friends of Syria—a group of 11 nations—to isolate extremists and bring the core of the opposition to the negotiating table. Of course, it’s not that simple. In recent months, it is true, Russia has quietly been distancing itself from the government in Damascus. Perhaps, Moscow might compromise on seeking some sort of coalition government involving Assad partisans and rebels. But not if it includes the extremist, Al Qaeda–allied forces that seem to have the upper hand in the fighting. Even some of the “moderate” Islamist rebels in Syria will have to be elbowed out of the deal, with more establishment-minded anti-Assad forces coming to the fore. The Post, like many neoconservatives and Israel, too, is itching for another Middle East war. In 2012, Obama flatly rejected advice from Hillary Clinton, Leon Panetta, David Petraeus and Gen. Martin Dempsey to arm the rebels. Let’s hope he stays the course. Did FBI questioning push Tamerlan Tsarnaev toward extremist views? Read Robert Dreyfuss on the Boston bombers.